What's Better Than a Payday? A Payraise! Swim team season has started up again, which means lots of practices and meets for my three kids. Which means granola bar consumption has spiked. I spent a truckload of time in the amazingly overextensive granola bar aisle of QFC, reading labels, coming to the disheartening conclusion that--news flash!--granola bars do not qualify as health food. (And that's not even counting the "chewy" variety because I suspect the only way baked goods stay chewy is plenty of chemicals.) Granola bars are especially not health food when your kids reject the kind with chunks of real dried fruit in favor of those with real drizzled chocolate. As processed foods go, these Nature Valley ones aren't bad. Some soy flour I didn't want, along with two instances of so-called "natural flavor," but otherwise not too bad of stuff, all wrapped up in nonrecyclable plastic. I could've gone with the hot new KIND bars, and sometimes I do, but all those real ingredients mean they are decidedly expensive. And they, too, come in the nonrecyclable plastic. So I got the brilliant idea that I would make homemade snack bars, and a little searching on the internet turned up this extremely helpful post. Wow! Thanks, The Yummy Life! My first batch of "Dark Chocolate, Nuts and Sea Salt" came out beautifully, although the caramel-ish sugar stuff holding all those nuts together threatened to pull out my fillings. The girls loved them, as did the others I gave samples to. Only my boy objected. He's in braces, after all, and those giant almonds were off-limits, even if he liked giant almonds. That's when the brilliant idea hit me that I could use mostly peanuts, resulting in the homemade equivalent of a Chocolate-Drizzled Payday Bar. Wow. But what to name it--is there something even better than a pay day? Why, a pay raise! Grease a large mixing bowl and a 9x13 pan with butter. Mix the nuts, seeds, and millet in the bowl. No nutritional value, but kinda fun! Heat the syrups, vanilla, and 1/4 tsp salt in a saucepan until it froths and reaches 260F on a candy thermometer, otherwise known as "hard-ball stage," the candy equivalent of we're-not-messing-around-anymore. Immediately pour the syrup over the nut mixture and blend. Then spread in your greased 9x13. With buttered fingers, spread the mixture evenly to fill the pan. After 20 minutes of cooling, turn it out on a sheet of parchment paper. You'll have to beat on your dish to make it come out, but beat away and have patience. Slice into twenty bars before it cools off and gets too "crunchy." Then melt the chocolate chips and oil in the microwave, stirring every 20 seconds, until it's smooth and melted. Drizzle (or dump) over your bars. Let cool completely. Wrap bars individually in wax paper or parchment or plastic wrap and keep in the freezer. When you want one, thaw it five minutes and enjoy! Are they still glorified candy bars? Yes. But as occasional treats, they're way better than a cookie or candy bar. Note, in particular, the 21g of sugar and 27g carbs, along with additives. Considerably fewer carbs and less sugar. The protein is a smidge less, but at least it's all from nuts, and not soy. As a final plug, the homemade ones were a snap. Less time to make than a batch of cookies! So remember these, the next time you're the snack parent for a crew of nut-eaters. P.S. Two more Thursday Markets to go, and I assure you my next post will be healthy. Cross my heart with sticky fingers. My kids tell me up to one-third of their classmates will miss school today to attend the Seahawks victory parade. It's all part of the spirit of oneness (or Twelfthness) and camaraderie that has swept the region these past few weeks. We're all winners! We can wear jerseys that do not embarrass us or excite the the pity or condescension of other sports fans around the country (save that experience for Mariners season)! We all watched that game, we all screamed ourselves silly, we all berated a Broncos fan among our friends and relations, and we all--I'm going out on a limb here--ate the same storebought foods/snacks from Costco. I'm serious. I'd love to do a region-wide poll. Did you have the pulled pork? Check. The meatballs? Check. The guacamole and seven-layer dip? Check. The spinach-artichoke dip? The tortilla chips. Uh-huh. I made and brought a five-layer dip to the party we attended, but I suspect it was one of just three homemade items on the groaning buffet table. What would we do without Costco and Trader Joe's? Don't get me wrong. I just went to TJ's yesterday and loaded up on cereal and the other processed foods that I can't/won't reproduce at home. Yes, I could make my own crackers, but what a pain in the behind! And as for making "Shredded Spoonfuls," forget it. 1. If you're the kind of person who likes to READ cookbooks, rather than actually get around to making things out of them, you'll like this one. Practically all the Goodreads reviews are about how the reviewer enjoyed reading it. I am not a cookbook reader. I skip all the things that aren't recipes or pictures. Even the fact that each recipe had a subtitle like "Yellow Cake - or - The Gift" kinda drove me nuts. 2. The children in this family are so lucky. Their mom makes them Pop-Tarts, even (that cover pic!)! 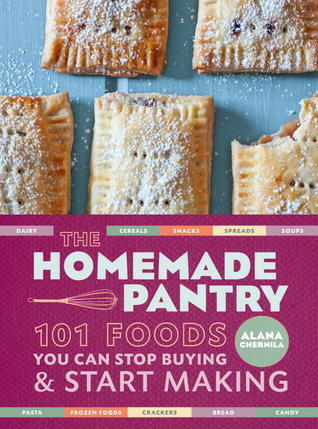 I flipped through, especially interested in the dairy products, but I could see that about 90 of the 101 Foods I Can Stop Buying & Start Making were going to stay firmly in the Still Buying & Not Making column. I will do homemade pizza and yogurt and bread and roasted nuts, but there is not world enough or time for me to tackle homemade mozzarella, Pop-Tarts, graham crackers, fruit leather, or Twinkies. 3. I am giving up again on homemade sour cream. I've tried it twice and hoped to do a post on it, but both times it was not good. The yogurt was another matter, and I'm now a homemade convert. 4. We have certainly enjoyed Chernila's recipe for Mixed Roasted Nuts at least as much as Deborah Madison's recipe and very nearly as much as my friend Sarah's recipe. All of which is to say, there will always be a place for Costco and Trader Joe's in my heart and pocketbook because there will always be those processed foods I can't bring myself (or my family) to give up. I will say proudly that we've stopped with the sport drinks, even the so-called "Vitamin" Waters I was letting the kids have at swim meets. (Tons of sugar in those things--best to reserve them for pouring over people in moments of victory.) Instead we're bringing homemade hot chocolate in a thermos, where I put in only about 2/3 the sugar the recipe on the cocoa tin calls for. The cold temps today call for just such a thermos, if you plan on turning out for the parade. Go Seahawks! Baseball season is upon us. And I don't just mean the annual, Northwest, we're-gonna-make-it-to-the-playoffs--oh, scratch-that--we're-hoping-to-break-.500 roller-coaster-ride that is the life of a Mariners fan. I mean Little League. Having never played a kids' sport myself, I don't know if they were always the nonstop snack-a-thons they are now. Snacks for some of the practices, snacks after every game, big thing of cupcakes at the end of season. Oh, and don't forget the Gatorades and Big League Chews in between. Maybe having reset our children's baseline blood sugar level at just-under-diabetic, we don't want to risk letting it dip. Add to the sports snacking, the constant snacking at school. My children are requested to pack a snack, and parents are asked to provide classroom snacks for the unfortunate few who forget to bring their mid-morning rations. Then, with the rising class sizes, it's always somebody's birthday, so you throw some cupcakes or donuts or Rice Krispy treats on top of that. Whew! No wonder Business Week recently reported on how American children have become grazing snackaholics, getting a stunning 27% of their daily calories from "salty, fatty and sugary treats"! While my children don't get morning snacks, I'm as guilty as the next mom when it comes to letting them raid the pantry in the afternoon, and doing my part to feed the habit when I'm signed up as the snack mom, or it's my child's birthday. Occasionally I get virtuous and insist on fruit, or pop my own popcorn to share with other kids, but I've yet to see the child who agrees to celery with peanut butter as his classroom birthday treat. I'm reminded of the scene in THE FELLOWSHIP OF THE RING where the Hobbits get sidetracked on their cross-country odyssey by their constant grazing, to Aragorn's annoyance. Strangely enough, they find, he doesn't eat "second breakfasts" nor "mid-morning snack" nor "elevensies." Somehow, we parents have stopped raising children and started raising Hobbits. We can only hope that their new diet of salty, fatty and sugary treats only stunts their growth, Hobbit-like. The hairy feet might be a little much. If you're the type of person who reads blogs about farmers markets, you might have some great ideas to share. How do we break the snacking habit? And, if we have to do snacks, what can we offer that's both healthy and appealing?